So, how important is novelty? A common criticism of things called bad in pop-culture (movies, TV shows, games, music, and everything else) is that it is derivative, that it’s been done before, that it’s too similar to something else. On the other hand, we classify all these things by their similarities and then judge them within those classifications. We go damn crazy about it actually. 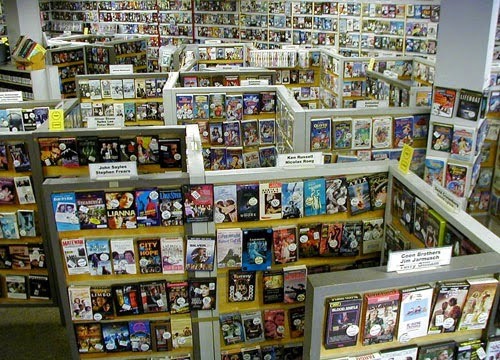 I work in a used movie store and people ask me where to find things. Music: techno, house, trance, classic rock, hard rock, alternative rock (to what? ), metal, death metal, speed metal, grunge, pop, synthpop (!! ), R & B, rap, gangster rap, etc. Movies: Action, horror, comedy, horror-comedy, tragicomedy, romantic comedy, drama, western, sci-fi, space western, fantasy, independent, “art” (? ), etc. Sometimes we condemn something for being derivative, and sometimes we excuse something derivative by appealing to the “genre” it’s part of, letting it off the hook specifically because it is like a bunch of other stuff. Focusing on movies (as I tend to do in these articles) many people like romantic comedies (or action, or horror, or whatever) as a genre, seeking movies out because they follow a set of forms and answer to a bunch of expectations. And yet, “it’s been done before” remains a criticism. So, what is the sense here? What are we doing, guys? One reply, if we’re honest about it (and many brazenly are), is that we are looking for a fix. We’re trying to get back some feeling, some reaction that we once had to a tune or a film, but no longer have with the same intensity from the same source. After you’ve had a Snickers bar, you don’t want another one. Or, even if you do, it isn’t as yummy. This explains both the desire for novelty and the tendency to pigeon-hole everything. The first time I had a Snickers, I’m sure my senses exploded with delight. But it was a kind of delight produced by candy, not delight produced by the flight of a blue-jay or the light of the summer sun through the trees. It was candy that did it. Even more specifically, it was creamy candy with nuts in it and chocolate on it. It was delightful, and we are drawn to delightful things. But, at some point, when I seek out another Snickers, the delight has fled. “Maybe it’s hiding in another candy bar!” says my brain-stem, and I buy a Whatchamacallit or some other thingamajig, looking for the lost yumminess. I want novelty, because the delight in the same thing is gone, or I’m too tired of it to experience it, but I’m looking for something specific, so I look for it in similar places and things. Ok, this tendency is important to notice, because it is a logic people are more or less consciously driven by, but so far we’ve been vulgarly behavioristic in our discussion. Is there anything more elevated, more important about novelty? Or, something of value we’re missing in repetition?